This pillow is a bit more casual and fun! I love this design...a whimsical look, with your names and date below if you like (you can also choose just to not have the names and date). The pillow can be done in your color satin, and the embroidery can be done in any color with ribbons to coordinate. 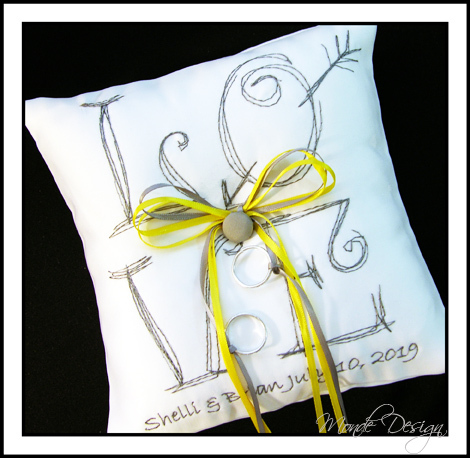 This pillow features multiple thin ribbons to emulate the embroidery design, but it can also be done with a single thin, medium, or wide ribbon (please specify in notes if you want an alternate style). Please put in changes in design that you would like in the order notes, including ribbon styles and colors, and name/date options (additional fees may apply for multiple design changes).